For Health, Wellness, and Fitness.....It's a mindset....: Are all Calories Created Equal? So, what is a calorie? Are fat calories equal to carbohydrate calories? Nope, not the same! Ok so that's the science of it. Bottom line, that heat is expended in energy by our body at a certain rate ... sometimes fast...sometimes slow, but generally the faster the better. To burn calories faster we have to move! Thats a blog for another day. Today I just want to talk about fat calories vs. carbohydrate and protein calories. Many of todays diets are based on how many grams of fat we should have daily(about 30%) and how many grams of carbohydrate and protein we should consume daily . For instance a gram of fat has 9 calories, whereas a gram of protein or carbohydrate only has 4 calories. In case your interested alcohol has 7 calories per gram. 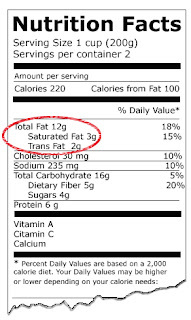 So, if you are reading a label on the back of a packaged food, it really helps to know how to calculate how much of that food's calorie make up comes from fat, that is if you are watching your fat grams, which I believe we all should. 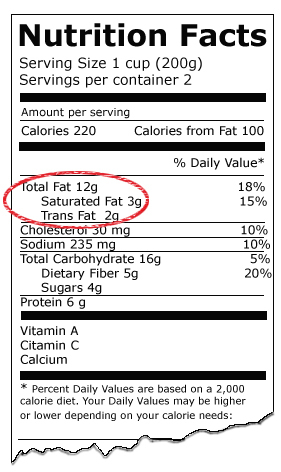 When you are looking at a label just multiply the number of fat grams by 9 and you will know how many calories are from fat.. On this label it comes out to 108 which is not what is stated on the label....hmmmm. Why is that you ask? Because according to the FDA they don't have to be exact on the labeling, they are allowed to "round it off." So when something says O grams of fat, it's not necessarily so. If you want to know the exact rules you can go to the FDA website here. Happy label reading!